G. Emeka Onwezi is a skilled attorney who provides legal representations for his clients in areas such as bankruptcy, foreclosure defense, criminal defense, civil litigation, construction law, corporate formation, tax litigation, Wills and Trusts, among other legal areas. He is also a Maryland Notary Public. 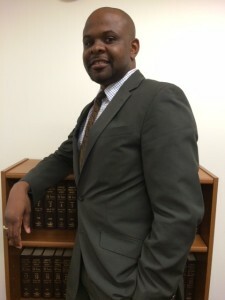 In addition to his experience as a licensed attorney in all the state and federal courts in Maryland and Washington, D.C., Mr. Onwezi mentors younger attorneys and law students. Mr. Onwezi joined OAU Law Group LLC, after being a sole practitioner for four year. Prior to that, he was an associate at Odelugo & Johnson, LLC (Formerly, Odelugo & Associates PLLC) and also a Judicial Law Clerk for the Michigan Tax Tribunal. Mr. Onwezi obtained his Jurist Doctorate degree from Western Michigan University Cooley Law School in May 2003 with distinction and his Bachelor of Arts from University of Maryland, College Park. Mr. Onwezi served in the United States Marine Corps for four years active duty and six year inactive duty. He was honorably discharged in the United States military in 1996. With his military experience and legal experience, Mr. Onwezi represents his clients aggressively and professionally. Mr. Onwezi is a member of American Bar Association, Maryland Bar Association, District of Columbia Bar Association, Nigerian American Lawyers Association, and J. Franklyn Bourne Bar Association. Mr. Onwezi is an avid sports fan and also enjoys traveling. He is a 4th degree member of the Knight of Columbus.